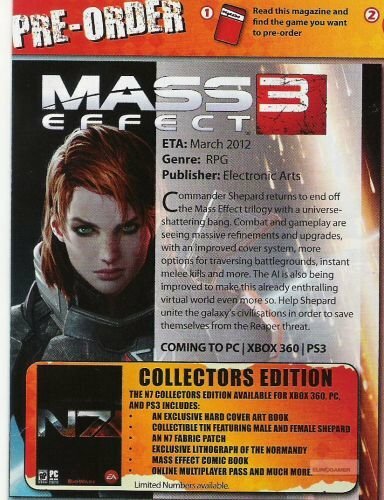 A scan of a South African magazine, below, reveals the contents of the Mass Effect 3 Collector's Edition. In that list is mention of an "online multiplayer pass". Sources have told Eurogamer that Mass Effect 3 includes an online enabled co-op mode that is standalone and features competitive elements. We understand BioWare Montreal was creating a multiplayer Mass Effect experience, either as a standalone game or component of Mass Effect 3. "We haven't talked at all about multiplayer in the Mass Effect franchise, but we're exploring multiplayer in all of our games and all of our franchises," BioWare co-founder Ray Muzyka told Eurogamer in June. "It's always an idea we're interested in. "The short answer is we have no comment on that. But we're interested in the idea of multiplayer." Separately, Eurogamer understands a Mass Effect-related announcement will be made later this month. Will it be the addition of multiplayer? Gud, låt oss hoppas att det är någon på tidningen som har önskedrömmar. Håll mina Mass Effect-spel fri från multiplayer online-skräp tack!